With the BioPhotometer plus, Eppendorf offers a compact UV/Vis photometer for use in molecular biology, biochemistry and cell biology. 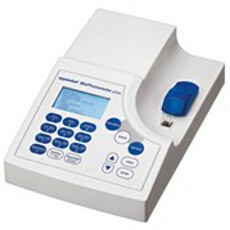 The photometer provides instant, out-of-the-box access to 32 routine methods, of which 9 methods are freely programmable, e. g.: [list] [*] Measurement of DNA, RNA and protein concentration (UV and colorimetric) [*] Incorporation rate of fluorescent molecules (550 nm/650 nm), e. g., for microarray experiments [*] Enzymatic assays (e.g., peroxidase, alkaline phosphatase, Β-galactosidase) [*] Optical density of cells (OD 600) [/list] Both measurement and calculation of results are performed at the press of a button, and the results of the analysis, as well as all accompanying data, are available at a glance. This guarantees safe, error-free operation and reliable results. In addition to its low weight, the photometer is small, yet extremely sturdy due to a robust metal housing, which allows for easy transport and cleaning. The BioPhotometer plus is designed for use with cuvettes such as the Eppendorf UVette®, but is also optimized for measurement of small volumes through the use of microliter cells such as Hellma® TrayCell. The new BioPhotometer data transfer software can now be used to transfer all measurement and calibration data to a PC. Besides enabling the printing of results it also allows results to be exported to data processing software for further evaluation. The program also offers the option of data archiving, which can be clearly configured with an optional user administration. New and used EPPENDORF BioPhotometer Plus's for sale on LabX. Purchase and get quotes on the products you need for your lab. Choose from a variety of vendors.